I was super excited for Halloween this year since Sarah is old enough to walk around and beg for candy that I won't let her eat from our neighbors. I tried to follow my mother's foot steps of crafting a wonderful costume for my daughter but since I can't sew I had to go with what I know--tutus. I don't have many skills but I can make a mean tutu. So when I saw this costume idea on Pinterest I decided to go with it and with some help from Eliza who painted the shirt for me Sarah was a ghost for Halloween. 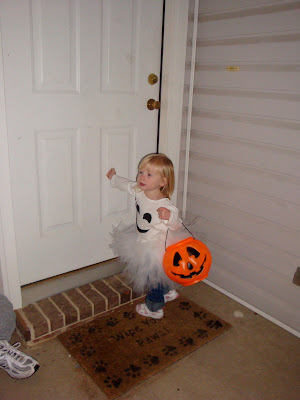 She even walked around saying "Boo!". 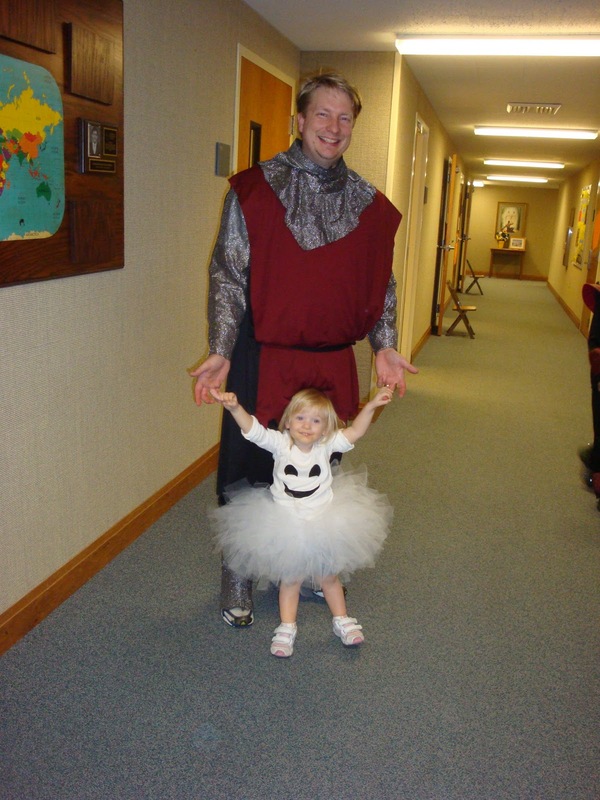 Our dry run of the costume was pretty tragic she bawled hysterically when I tried to put her tutu on her. I finally bribed her into it by letting her watch a show as long as she had it on. But thankfully we both have our Knight in shinning armor who convinced Sarah to put her costume on and be happy about it. 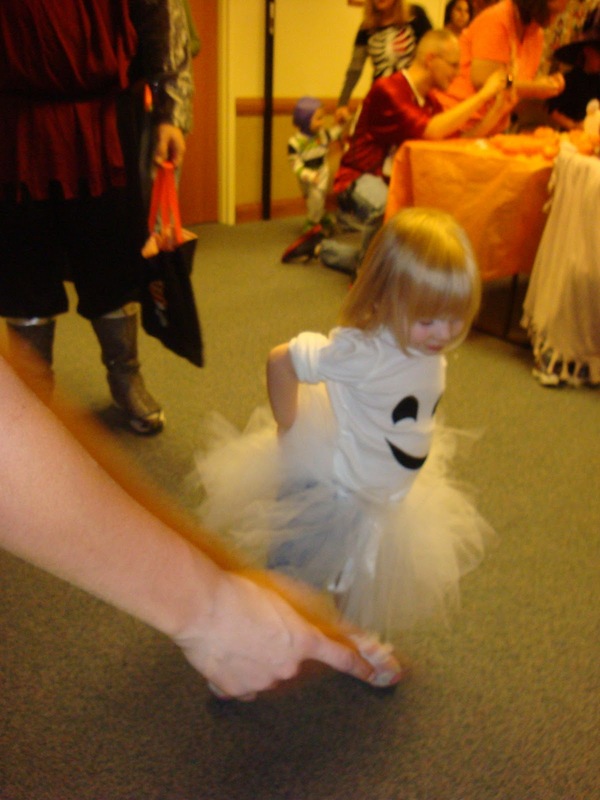 She loved her ghost costume and wore it all around the various Halloween festivities we went to. Cody and I spent Trunk or Treat just hanging out. Regardless of the fact that he got mistaken for a cow and a horse, Cody was a giraffe for Halloween. Here's Sarah playing games at Trunk or Treat. She really didn't get the concept of any of the games but still seamed to have a good time. Her favorite part was getting to decorate a pumpkin. Well, she didn't actually understand decorating it with stickers but she loved the pumpkin and carried it around the house for the rest of the week. 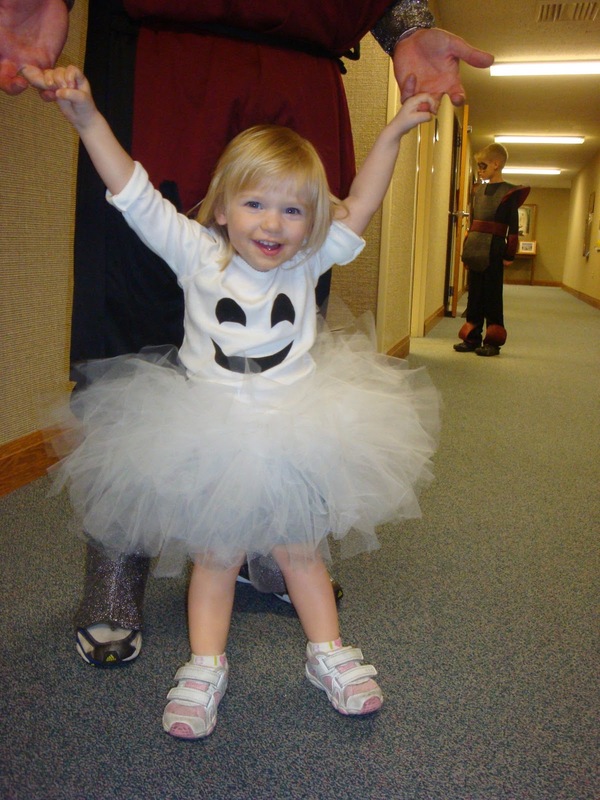 The next Halloween festivity was trick or treating in the exercise classes at the Y. I'm glad I was done with my class and got to help walk her around the Silver Sneakers class so I could actually see her trick or treat. 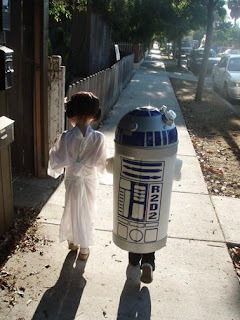 (We had already decided that Chris would take Sarah around the neighborhood.) She was so cute! At first she was a little confused but eventually she got the hang of it and would walk up to the people and say "treat please" and then hold out her hand. Her favorite part was putting the candy into her pumpkin bucket. 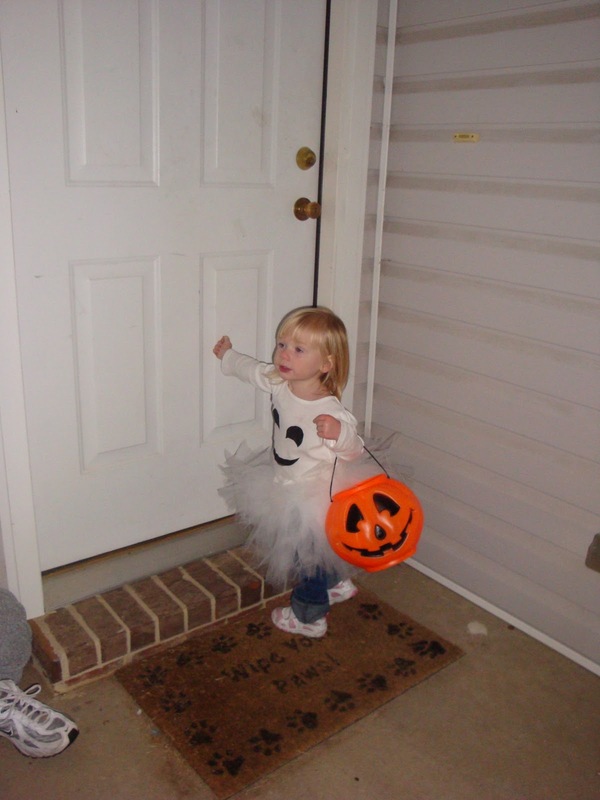 What was great was the side effect of her early trick or treating. For the rest of the day she kept saying "Happy Halloween Mommy!" and handing me candy out of the bowl because that's what the old people in the silver sneakers class kept doing. It was adorable! Here's our attempt at the obligatory picture in their costumes. My favorite is the last one there where they've both just completely had it. Ok, I guess we'll call this one good. While we were 1 of 3 houses on our street that participated in trick or treating, apparently the two other streets had more lights on. Sarah wanted to ride in her wagon over to the other streets but when she saw the other kids Chris said she got out and walked a lot. Apparently the ghost costume wasn't obvious because Chris said he kept hearing people say she was a pretty little ballerina. 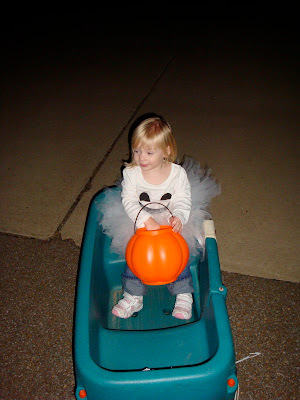 But at least she liked her tutu! Chris said she kept pointing it out to people while she was getting candy. She was a good little girl and knocked nicely on the door and said "treat please" and "thank you". I love her little manners. It's so sweet to hear her say "thank you mommy" when I help her with something or give her something. She even says "bless you" now when someone sneezes. She's so adorable! So we had a great time with Halloween this year. I'm looking forward to when the kids are both old enough to be dressed up and walk around on their own. I've got some ideas for costumes. It's gonna happen one day! I love their future costumes. So cute! And I totally got she was a ghost....a dang cute ghost. I love Halloween, it is one of my favorite holidays.